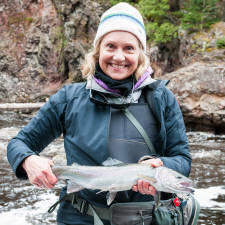 Are you interested in fly fishing the North Shore of Lake Superior? 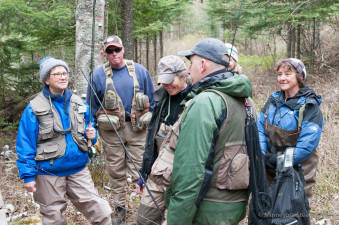 Maybe you are completely new to fly fishing and interested in learning? 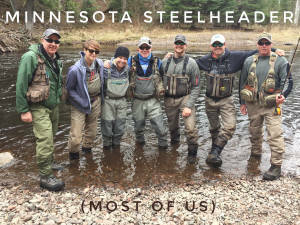 Maybe you already know how to fly fish but are looking for an opportunity to learn about the diverse North Shore fishery? 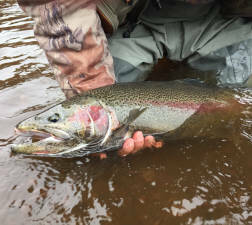 Maybe you just want to know what it takes to catch a monster Steelhead? If you answered yes to any of these questions, this unique clinic is for you. 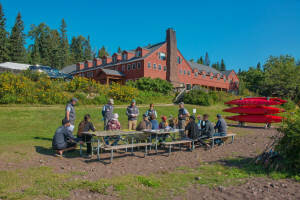 Minnesota Steelheader, and Lutsen Resort on Lake Superior, have partnered for an informative, fun, hands-on learning experience. 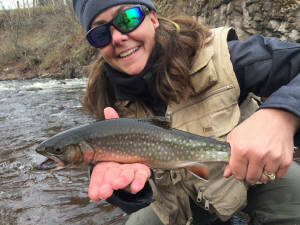 This clinic weekend will be entertaining and an approachable opportunity to learn the tips, trick, and techniques for year round fishing on the North Shore of Lake Superior. 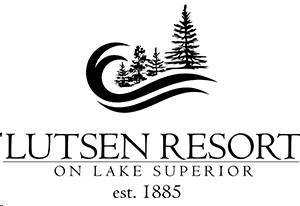 Lutsen Resort is located on the North Shore where the Poplar River meets Lake Superior - a beautiful setting. - Friday evening: Hors D'oeuvre's & cash bar during the off-water learning presentation. - Saturday evening: Trout dinner then informal conversation about the days success over a cocktail... or two. Space is limited to 25 anglers. Register you and a fishing partner today! Our all-volunteer instructors will teach you about the species that swim our rivers; how they got here, who was here before us, when they migrate, and why they survive such a challenging environment. 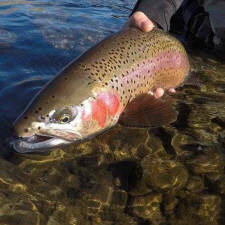 Our emphasis will be on the spring steelhead (rainbow trout) migration as it will be in full swing! We teach a little on how geology and limnology impact steelhead trout and salmon. 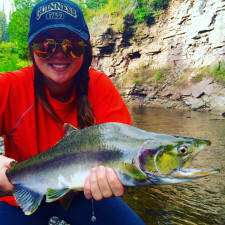 We review fishing equipment that is suitable for steelhead, trout and salmon including: rods, reels, line, knots, flies, and misc extras. We discuss the different methods we find effective for catching trout in different types of water. 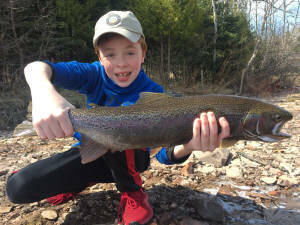 We inform you about all the trout and salmon that swim our waters and how and when to target. We also go in to detail on how to read water and the terminology for the different types of water/current within our rivers and streams. There will be lots of information given to help all skill levels enjoy a wonderful day on the water. 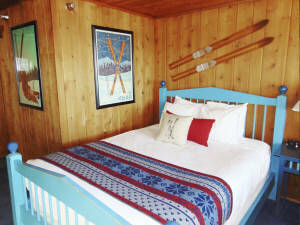 We also have time set aside to review and assist with setting up your personal fishing gear! We do this all during the evening before hitting the water Saturday morning. 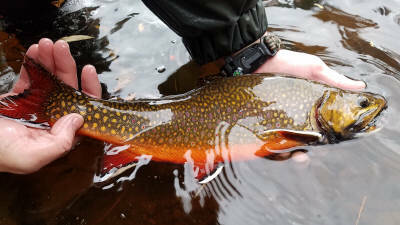 Once streamside, there is hands on instruction to locating fish, fly selection, and presentation. Our goal is to help anglers locate productive locations within the river and start fishing. This is not a fly casting class, but assistance and cast coaching will be given to those who need it. You will be in good hands with our instructors. First and foremost bring a positive attitude. Bring your own equipment if you have it. If not we will have some fly rods for you to use during the clinic. 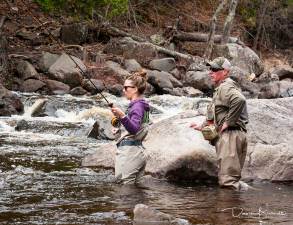 Waders are not required, but will allow you more angling opportunities. Bring your favorite flies too! we will have some as well for you to use, but it is always good to have a lot of back up flies. This clinic (the on the water portion) is open to those who are able to freely maneuver the rocks, gravel, and maybe snow along the banks of the river. Standing on the bank is pretty straightforward, it is the walking on rocks and any wading you decide to do that requires a good sense of balance. Note too that we focus on entry level wading - no deep water, most wading is less than knee high. Wading is not necessary to partake in the clinic. Some other suggestions: Wading staff, net, forceps (hook removal), sunscreen, rain gear, warm base-layer clothing, and a camera. 6 - 8 weight Fly Rod: 8 weight is a great spring rod, 6 weight is good for summer and fall. 7 weight is a good all around. 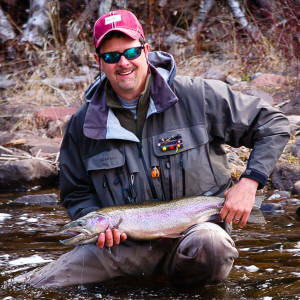 If you plan too focus mainly on Steelhead, an 8 weight is our suggested rod. 6 - 8 Fly real with backing: This can be spooled with floating fly line, or running line (specific for drift fishing). Running line can be either floating fly running line or 14 - 17lb. bright colored monofilament. This method does not follow the traditional fly casting technique, but rather more of what is called, chuck & duck. Weight is added to the line to help deliver your fly rather than relying on the fly line to deliver. We discuss in the presentation the value and effectiveness of each. Wading boots: If using stocking foot waders (our favorite) we recommend good boots with either felt or the new alternative to felt design. cleats in the boots never hurt. As with all of our recommendations we review the value and use of all items. Flies: We will have some for use, but it is fun to have your own personal selection. We use a lot of egg patterns in pinks, orange, chartreuse, red most of the shades in between, sized in 6 - 10. Wooly buggers (sized 6 - 12), wooly worms (6 - 12), pheasant tail type nymphs (sized 8 - 14) work well as the water warm. Bright streamer patterns, and variations on nymphs that have some flash. Sunglasses - POLARIZED: A must have. They cut the glare allow great visibility in the water and cut down on fatigue from the sun.